Advertisers become more savvy at marketing to children as new research shows that more and more parents make purchase based on the opinion of their offspring. Parents buy products in stores under pressure from their children – at least that is the conclusion drawn from independent research by three companies in both Russia and the United States. Retailers, naturally, are aware of these trends and structure their ad campaigns accordingly. According to statistics from American researchers at Promotional Products International (PPI), the purchase of nearly 50 percent of all products around the world is influenced by children. Children influence not only the choice of product, but also the brand purchased and the store where the purchase is made. This statistic is especially true for food. In both the United States and Russia, children influence about 40 percent of all food sales, according to date from PPI and Gkf Rus. There is one important difference, however. In Russia, unlike in the United States, the vast majority of all purchases are made by women, and those women are more often accompanied by girls than boys. Russian retailers bear this in mind, aiming most of their sales promotions at mothers with daughters. In Russia, 55 percent of all mothers do their shopping with a child in tow. More than a third of Russian women (36 percent) are ready to buy all food products suggested by their children. Moreover, these parents are unable to pass up sales promotions in which their children want to take part: Nearly 100 percent of Russian mothers are ready to choose the store that is having a sales promotion that their child likes over the store where things are less expensive. The only factor that will deter a parent from giving into a child is cost. If the cost of taking part in a sales promotion is more than 500 rubles ($17), the parent will think twice. According to Maria Kurnosova, press secretary of supermarket giant Auchan, Russian retailers have begun reviewing their marketing strategies and sales policies with an eye to children’s needs. More and more sale promotions and ads are aimed at attracting buyers with children. Food products are also displayed in a special way: anything for children must be brightly packaged and placed at the child’s eye level. The influence of children is also taken into account in stores belonging to the X5 Retail Group. “In coming up with the assortment in our stores, we consider not only the preferences of our adult audience, but the wishes of children. In anticipation of the New Year’s holiday, our assortment features dozens different kinds of sweets, children’s toys, gift sets and Christmas tree ornaments,” said Svetlana Vitkovskaya, head of public relations at X5. In December, for example, the supermarket chain Perekrestok is running a “Dominomania” promotion whose principal heroes are characters from the animated film “Ice Age.” These characters have been used as decorations on the packages for an exclusive line of “Ice Age” X5 products, including dairy products, nuts, candy, lemonade and many other foods children like. The “Ice Age” products are also presented in small packages that are appealing to children and easy for them to use. In addition to food products, children encourage their parents to spend money on toys. Some 60 percent of all parents are guided by the opinions of their children when deciding which toy to buy. 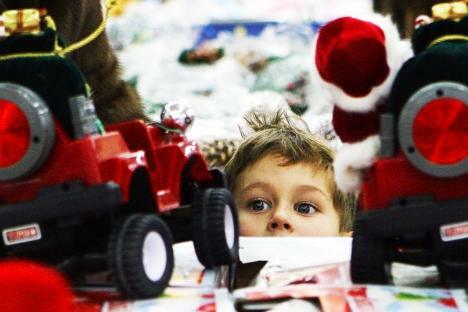 Analysts at Detsky Mir (Children’s World) predict that the market share of goods for children in 2011 will increase by 15 percent due to the increasing amount of expendable income among Russia’s middle class. And this year for New Year’s (when presents are traditionally exchanged in Russia), parents are ready to spend 5-7 percent more on their children than they did last year. In 2012, given a stable economy, the market share should increase by another 16 percent. Mikhail Safran, PPI Worldwide’s representative in Russia, said that understanding children and their needs will also help move goods for adults. Anastasia Tsitsulina, president of the Association of Children Toys Industries agreed that these numbers will help manufacturers target their marketing strategies more effectively. Tsitsulina noted that ads on children’s TV channels cost less but are no less effective than those on other channels at raising the level of sales. Research shows that a large percentage of the children who ask their parents for a certain product are themselves influenced by the opinions of friends and by ads.